This watercolour is an example of the ‘picturesque’, an aesthetic concept that evolved in late 18th century Britain. The ‘picturesque’ landscape was rough, varied and irregular. This work is typical of the style, with its river, rocks, winding path and rustic bridge supported by tree trunks. The writer and collector Richard Payne Knight (1750-1824) employed Thomas Hearne (1744-1817) to draw several views of the grounds of his country house, Downton Castle. Knight was an enthusiast of the ‘picturesque’ style of painting and landscape gardening. 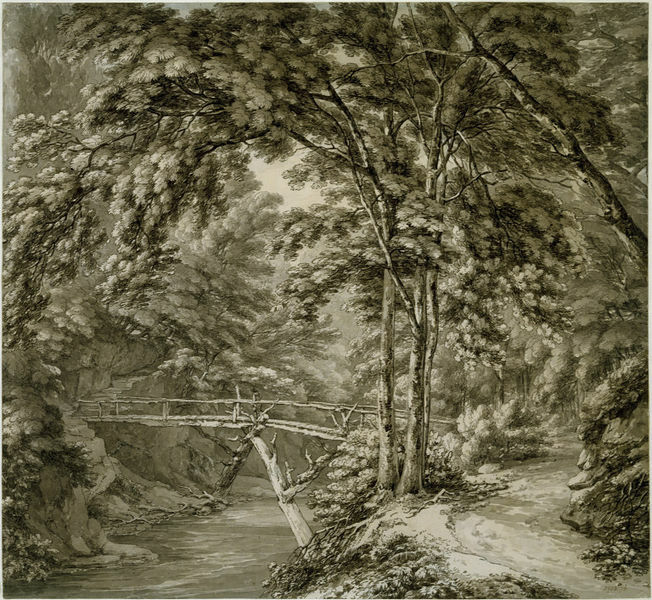 Indian ink and sepia drawing depicting a view of a wooded glen at Downton, Herefordshire, formerly the seat of Richard Payne Knight (1750-1824). Signed. 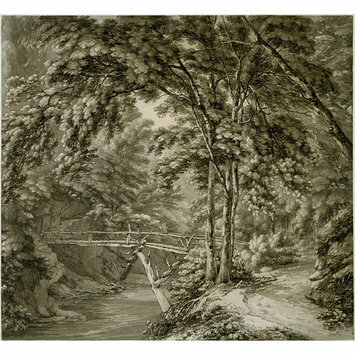 Indian ink and sepia drawing entitled 'The river Teme at Downton, Herefordshire' by Thomas Hearne. Great Britain, ca. 1785-1786.